We offer a whole range of leisure classes, from A to Z, open to all. Come and join us in 2018, our 28th year! We are a non-profit making group, independently run for the benefit of the local community. All the money we receive from fees goes back into the scheme. 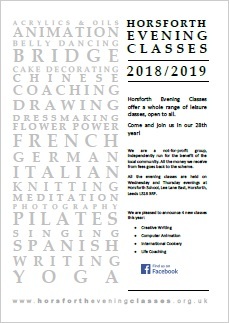 All the evening classes are held in Wednesday and Thursday evenings at Horsforth School, Lee Lane East, Horsforth, Leeds LS18 5RF.